Securall offers Medical Gas Cylinder Storage Cabinets for safe and compliant storage of portable oxygen cylinders. These Oxygen Gas Cylinder Storage Cabinets are ideal for hospitals and nursing homes for convenient access. 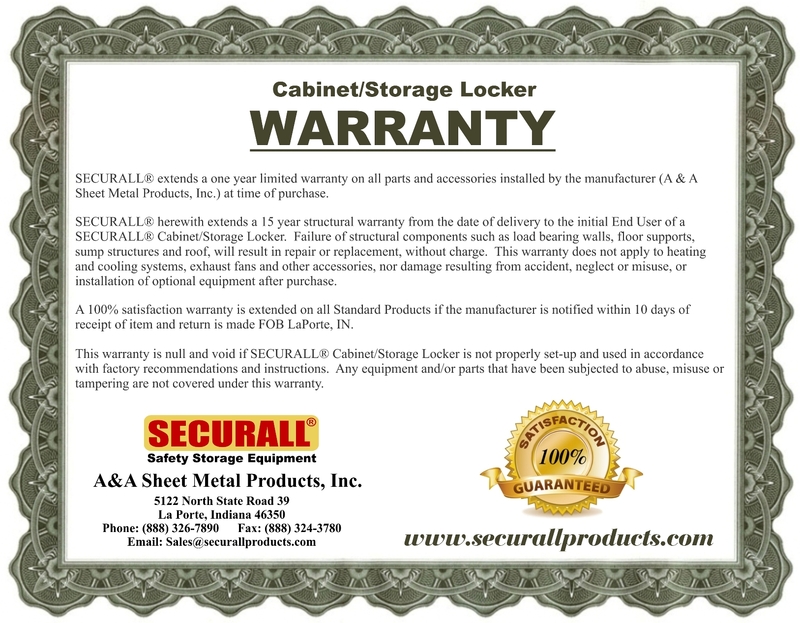 Securall storage cabinets store oxygen gas cylinders safely and in compliance with OSHA and NFPA standards. One year limited warranty on all parts and accessories installed by the manufacturer at time of purchase. 15 year structural warranty from the date of delivery to the initial purchaser. MG-Digital, Digital Keypad Lock; Approx Ship Wt. 5-lbs. MG-Label-Empty Magnetic Empty Label for MG Cabinets. Left & Right Arrow Labels sold separately. MG-Label-Partial Magnetic Partially Full Label for MG Cabinets. Left & Right Arrow Labels sold separately. MG-Label-Full Magnetic Full Label for MG Cabinets. Left & Right Arrow Labels sold separately. Left Arrow Magnetic Left Arrow Label for MG Cabinets. Right Arrow Magnetic Right Arrow Label for MG Cabinets. CA18 Caster Assembly (Factory Installed); 2 Rigid, 2 Swivel; Adds 4" to Height of cabinet; Approx Ship Wt. 30 Lbs. Cabinet Venting All Securall cabinets come standard with 2” Flash Arrestor Vents and bung plug for optional venting. Contact your local authority having jurisdiction for venting regulations in your area. EXM200 - Explosion Proof Exhaust Blower & Motor; 1/2 H.P. ; Approx Ship Wt. 50 Lbs. FGH200 - Galvanized Flexible Hose Assembly for Exhaust Blower; 15' Long, Approx Ship Wt. 21 Lbs. The interior and exterior finish consists of an aliphatic polyurethane finish. This polyurethane coating has chemical properties to withstand salt spray, chemical rub, fading due to UV exposure, and other tests performed to epoxy paints. Urethane is more durable under conditions when moving items in and out of the cabinet as it resists chipping and peeling. Unless some other color is specified, cabinets will ship in designated standard color. For custom colors, customer must provide a paint chip. Available with manual or self-closing doors. Conspicuous labeling in English and Spanish. Finished in 2 coats of OSHA Safety Green urethane. 9.5.1 The volume of Class I, Class II, and Class IIIA liquids stored in an individual storage cabinet shall not exceed 120 gal (460 L). 9.5.2 The total aggregate volume of Class I, Class II, and Class IIIA liquids in a group of storage cabinets shall not exceed the maximum allowable quantity of flammable and combustible liquids per control area based on the occupancy where the cabinets are located.